We became aware of S.K. Ali from our good friend Ayesha Mattu, author of Love, InshAllah fame. When we found out about the amazing work she’s doing, we decided to get her two cents on Muslim voices, books, and gummies. The Book Doctors: Why did you start #MuslimShelfSpace? S.K. Ali: In early December, I tweeted a picture of my shelf of works by Muslim authors in response to the news of a book that “parodied” classic children’s book covers using extremely racist imagery of marginalized communities. My shelf of Muslim authors offered narratives that stared down the awful stereotypes of Muslims included in the “parodied” covers. Friends wanted to post their own shelf pictures and we discussed how important it was that Muslim #ownvoices narratives be centered in order to counter all the Islamophobia the U.S. election season had brought to the fore, and voila, #MuslimShelfSpace was born. We launched the hashtag on January 1, 2017 and it garnered a lot of support from people committing to making space for Muslim authors on their shelves. TBD: Why is it so important to hear our “own voices”? SKA: Islam and Muslims are often, well, almost relentlessly, discussed in public spheres such as the media and politics, but Muslims who claim the identity are rarely involved in the conversations. The focus is on Muslims — without Muslim voices. When we have that happening — people of a certain identity talked about, talked of, talked for but never or very rarely DOING the actual talking — we can quickly slide onto the dangerous terrain of othering to the point of denying people’s humanity. And then we begin to see policies like the Muslim Ban moving into place. If that itself is not enough of an important reason to hear own voice narratives, what if I said they were immensely more entertaining than the faked stuff? Because authenticity — of the rarely seen variety — offers fresh takes and whoa, you’ll be taken to places/spaces you might not have visited before. Fun! The Chaos Walking Trilogy by Patrick Ness — breathtakingly ambitious and unique. The setting of the series is so out-of-this-world, yet familiar and the conflicts and issues explored are relevant to our point in time. It’s such an important series. When You Reach Me by Rebecca Stead — crucial to me as a writer because it wasn’t afraid to be what it was: unconstrained. As writers, it’s important to go back to that space when you first discovered the thrill of creativity, before it became fenced (in your mind) by the mores of those who’ve already shaped the literary landscape(s). This book helped remind me to just be and write free. The Disreputable History of Frankie Landau-Banks by E. Lockhart — I love girl power stories and this one was really well done, with a writing style that’s bare and upfront. It traces the moment of a girl waking up to the realities of gender inequity and proceeding to take the reigns of power into her own hands, all set to a backdrop of an old-money, private school. TBD: What are your feelings regarding the Muslim ban imposed by the current administration? SKA: The only feelings to be had on hearing such a vile thing: how does hate get to dictate the policies of a country with such a constitution, “We the People..”? TBD: As a Canadian, how did you react to the Canadian terrorist attack by a white man on Muslims? SKA: Utter sadness. And the remembrance that Canada is not immune to the Islamophobia sweeping many parts of the world. TBD: How did you become an author? SKA: Since I was 12, I’ve known that I wanted to tell stories. I proceeded to get my degree in creative writing and then set the dream aside when I embarked on motherhood and pursuing a career as a teacher. It was only recently — ten years ago recently — that I picked the dream up again. That meant writing, learning, rewriting, and repeating until I got a literary agent and sold my book last year. TBD: Tell us about your book Saints & Misfits. SKA: It’s about a Muslim fifteen-year-old, Janna Yusuf, who finds her voice in the midst of something painful. It’s also about the diverse communities, plural, she moves in — her high school, neighborhood, the Muslim community. 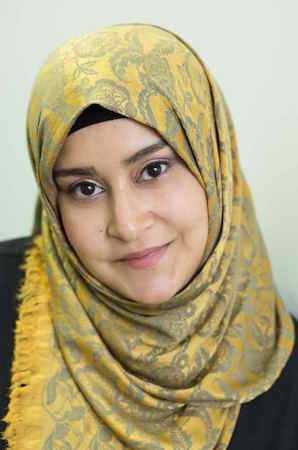 I’m honored that Saints & Misfits will be the first YA novel published by a major publisher, featuring an American-Muslim in hijab, set in an American-Muslim community. The book also looks at relationships in various forms, including Janna’s friendship with an elderly Hindu neighbor. TBD: Is it true that there are halal gummy bears in the book? TBD: We hate to ask you this, but what advice do you have for writers and citizens who’d like to see more diverse books on the world’s shelves? One thing not to do: PLEASE, PLEASE DON’T WRITE OUR STORIES FOR US. It’s really hard, impossible, even, to get it right and even the best-intentioned ones have a way of harming more than helping. And trust me, over the years, we’ve seen Muslim characters who, at their best, we don’t recognize and, at their worst, hurt us to the core with the way they’re depicted. For young readers especially, this kind of pain affects their understanding of their place in the world and that’s just too sad.